It\'s just great! Want to see the beautiful sunset in the tropical forest? Then our new Paradise Birds screensaver was created especially for you! We present you absolutely free animated nature screensaver. A very picturesque and bright sunset will decorate your desktop. 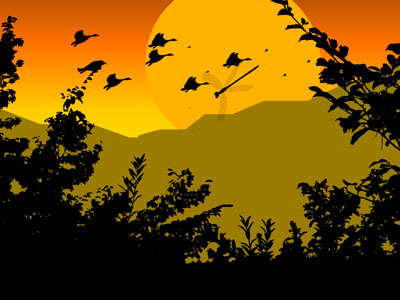 Paradise birds are flying happily in the forest against the backdrop of the sunset. Is it bad weather, rain, winter or autumn outside? With our screensaver the weather will always be good. Enjoy yourself right now! Download and install free Paradise Birds Screensaver, it will take just a minute.